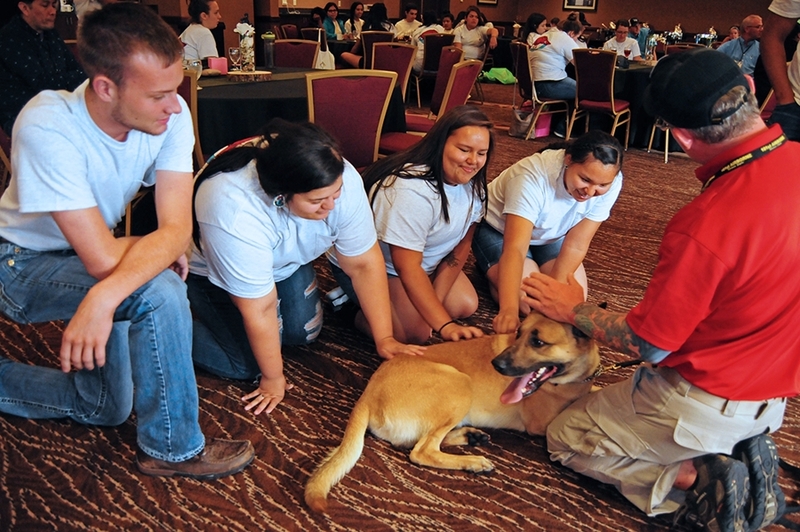 Native Youth in Food and Agriculture Leadership Summit students Zach Ilbery (Cherokee), Mackenize Martinez (Choctaw-Apache), Lauren Thompson (Cheyenne River Sioux), and Kiana Haskell (Fort Belknap) learn about the dog training operation at the Quapaw Tribe. FAYETTEVILLE, Ark. – The 2018 Native Youth in Food and Agriculture Leadership Summit recently hosted Native American and Native Hawaiian youth at the annual event held June 7-14 at the University of Arkansas School of Law. The summit was organized by the Indigenous Food and Agriculture Initiative at the School of Law. The summit provided an intensive, skills-focused curriculum that allowed attendees the opportunity to explore a particular area of food and agricultural production or policy in Indian Country. The four subject areas were agricultural business and finance; conservation practices and planning for agricultural production; agricultural law and policy; and nutrition and health. Within these curriculum tracks, students learned from industry leaders and experts about critical agricultural practices that will support them in their own farming and ranching endeavors and prepare them to assist with long-term agricultural planning and production at a tribal government level. Curriculum included the development of an Agricultural Resources Management Plan pursuant to the American Indian Agricultural Resources Management Act, principles of agricultural law policy, the importance of traditional foods and nutrition, natural resource conservation, agribusiness marketing, and the role of finance and credit in agricultural operations. In addition to these specialized courses, the students all participated in several general courses, including an incisive look at tribal governance with then-Dean Stacy Leeds and a full grower training for the Food Safety Modernization Act Produce Safety Rule. Students also participated in a field trip to the Quapaw Tribe of Oklahoma to tour their food operations and learn about agriculture in a tribal setting. The tour included visits to the Quapaw meat processing plant and feeding facility, coffee roasting facility, greenhouses and beekeeping operation, and dog training program. The summit was made possible through generous support from the national Farm Credit Council. Additional funding was provided by the United States Department of Agriculture’s Beginning Farmer and Rancher Development Program; USDA Natural Resources Conservation Service; NoVo Foundation and other foundations supporting the work of the Indigenous Food and Agriculture Initiative. About the Indigenous Food and Agriculture Initiative: The initiative enhances health and wellness in tribal communities by advancing healthy food systems, diversified economic development and cultural food traditions in Indian Country. The initiative empowers tribal governments, farmers, ranchers and food businesses by providing strategic planning and technical assistance; by creating new academic and professional education programs in food systems and agriculture; and by increasing student enrollment in land grant universities in food and agricultural related disciplines. About University of Arkansas School of Law: The University of Arkansas School of Law prepares students for success through a challenging curriculum taught by nationally recognized faculty, unique service opportunities and a close-knit community that puts students first. With alumni in all 50 states, the District of Columbia, two territories and more than 20 countries, it has been ranked among the top 10 "Values in Legal Education" by the National Jurist magazine for five consecutive years and is among the top 42 public law schools, according to U.S. News and World Report. About the University of Arkansas: The University of Arkansas provides an internationally competitive education for undergraduate and graduate students in more than 200 academic programs. The university contributes new knowledge, economic development, basic and applied research, and creative activity while also providing service to academic and professional disciplines. The Carnegie Foundation classifies the University of Arkansas among only 2 percent of universities in America that have the highest level of research activity. U.S. News & World Report ranks the University of Arkansas among its top American public research universities. Founded in 1871, the University of Arkansas comprises 10 colleges and schools and maintains a low student-to-faculty ratio that promotes personal attention and close mentoring. The show, featuring fashions, floral displays and lighting displays made by students is at 7:30 p.m. Friday, April 26. Vicki Collet, an associate professor of curriculum and instruction, recently received a Fulbright U.S. Scholar Award to Japan and Ireland to research the teacher education process in those countries. Roberta Sick, director of the Initiatives on Access and Justice - Partners for Inclusive Communities, was one of two recipients of the 2019 Arkansas Crime Victim Advocate of the Year Award. The University of Arkansas will hold the 17th annual "Take Back the Night" march on Thursday, April 25, starting at the Fayetteville Square and marching to Old Main on campus.